Spanning almost every design style you can imagine, the Kathy Ireland rug collection by Nourison offers a bold range of choices, all offering the same high-end luxury. Described by Nourison as ‘the most beautiful rugs on Earth’ the Kathy Ireland collection is all about luxury and exceptional design which stands out. The expansive Kathy Ireland range spans from bold stripes and contemporary clean lines to vintage and exotic designs which take inspiration from antique rugs and classic designs from history. Alluring ornamental patterns characterise the Malta Collection within the Kathy Ireland range whilst the Cottage Grove range is simpler, with an interestingly textured surface and bolder, cleaner colourways. 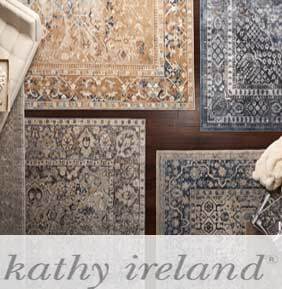 Kathy Ireland rugs are produced to the exceptional level of quality expected by Nourison. Many are loomed by hand adding to their high-end feel. Most of the rugs in the collection are available in a range of different sizes and colour palettes. There is a Kathy Ireland rug to suit many modern homes of all different tastes.